The Second World War was a German war like no other. Having started it, the Nazi regime turned the conflict into the most horrific war in European history, resorting to genocidal methods well before building the first gas chambers. 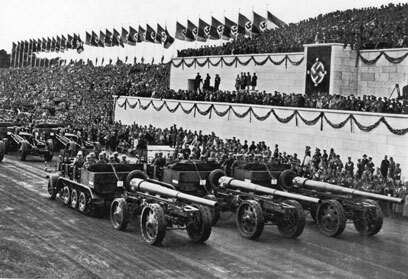 Over its course, the Third Reich expended and exhausted all its moral and physical reserves, leading to total defeat in 1945. Yet seventy years on — despite whole libraries of books about the war’s origins, course and atrocities — we still do not know what Germans thought they were fighting for and how they experienced and sustained this war until the bitter end. German Military in 1945. Photo: Getty Images. When war broke out in September 1939, it was deeply unpopular in Germany. Yet without the active participation and commitment of the German people, it could not have continued for almost six years. What, then, was the war Germans thought they were fighting? How did the changing course of the conflict — the victories of the Blitzkrieg, the first defeats in the east, the bombing of Germany’s cities — change their views and expectations? And when did Germans first realise that they were fighting a genocidal war? Drawing on a wealth of first-hand testimony, The German War is the first foray for many decades into how the German people experienced the Second World War. Told from the perspective of those who lived through it — soldiers, schoolteachers and housewives; Nazis, Christians and Jews — its masterful historical narrative sheds fresh and disturbing light on the beliefs, hopes and fears of a people who embarked on, continued and fought to the end a brutal war of conquest and genocide. I don’t think it’s appropriate to use this forum for teaser advertising. A posting of the main conclusions the author reached would be most welcome.